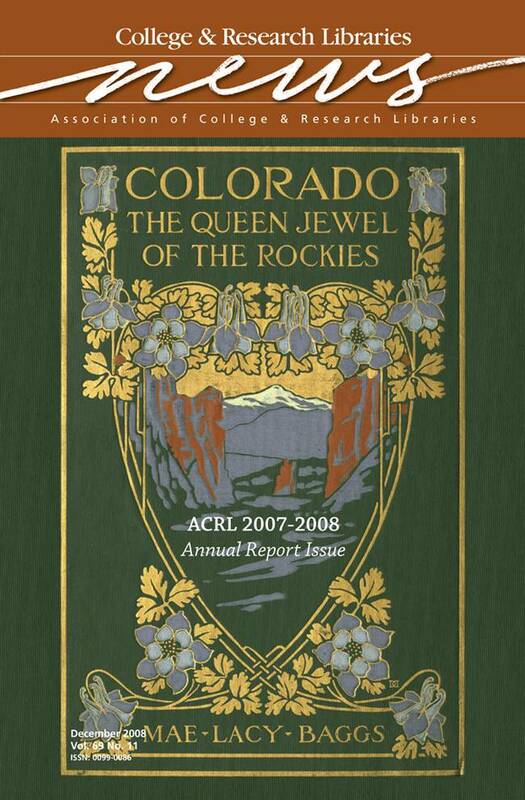 This month’s cover features Colorado: Queen Jewel of the Rockies, a travel guide in the Page Company’s See America First series, published in 1918. The volume provided travelers an overview of the natural beauty and history of Colorado, including “A description of its climate and of its mountains, rivers, forests and valleys; an account of its explorers . . . with some reference to what it offers of delight to the automobilist, traveler, sportsman and health seeker.” The same delights the Denver area offers attendees of the 2009 ALA Midwinter Meeting. The image is part of Colorado Guidebooks: An Online Exhibit, produced by the Archives and Special Collections Department of the Auraria Library, a shared library serving the Community College of Denver, Metropolitan State College of Denver, and the University of Colorado-Denver. Visit the exhibit online at archives.auraria.edu/guidebooks/.